Paddling on the Cherry River. There are several options for runs here, but one of the most popular stretches is the 9 miles from Richwood, WV, to the mouth of the Gauley River. The Cherry River runs are non-stop paddling with an average Class of II-III along the way. A tributary to the world-famous Gauley River, West Virginia’s Cherry River flows through the Monongahela National Forest in the Allegheny Mountains. While the river is known for its great whitewater, it’s far more forgiving than some of West Virginia’s other whitewater destinations. Cherry River’s rapids are generally Class II and Class III intermediate (though that can fluctuate in periods of prolonged rain), making a great run for nonstop action. At an elevation of just more than 2,000 feet, the river has a series of rock formations, eddies, and an occasional hole to navigate through. The land around the river is mostly rural and mountainous, which gives you an incredible scenic view the entire way to the Gauley. The Cherry River flows through a small town called Richwood, where you can even see the rapids from the town’s streets. With a population of about 2,000 people, watching paddlers ride the rapids through town is somewhat of a local pastime. There are different runs along the Cherry River, but a much-loved run is the 9-mile stretch that begins in Richwood across from the WaterGate Inn (formerly the Richwood Inn) and ends at the mouth of the Gauley River. American Whitewater classifies this run as a II-III, and it’s a nonstop paddle with some of the most beautiful scenery along this particular river system, flowing through historic Nicholas County. For a longer run, check out the North Fork of the Cherry River, which is 13 miles and mostly Class III, with a couple of Class IV rapids and dams downstream. A popular shorter run is the South Fork of the Cherry River, which is 6 miles and Class II-III. 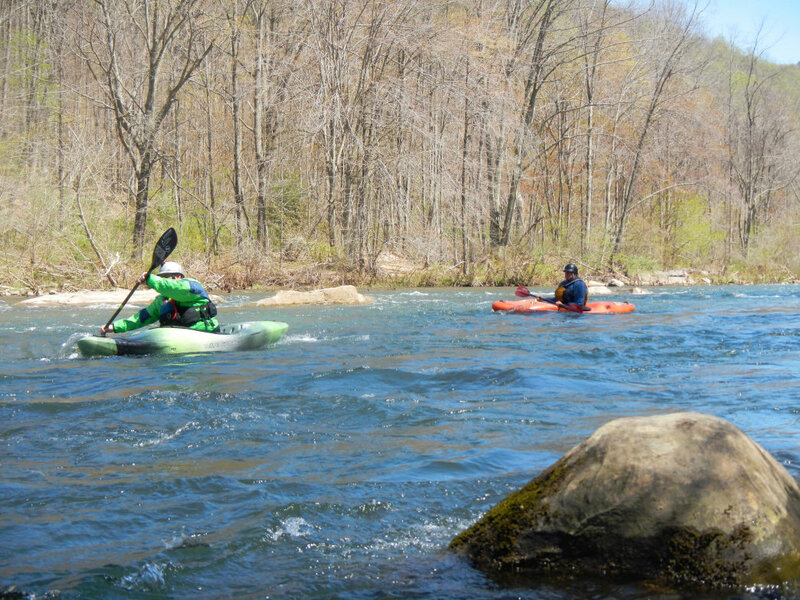 Intermediate kayakers who are comfortable with constant rapids and a gradient of about 30 feet per mile will enjoy the runs along the Cherry River, whether you’re taking on the 9 miles from Richwood to the mouth of the Gauley or a shorter or longer run along the way. The terrain on the Cherry will keep you on your toes, but without a huge variance in class levels. Because of this, the Cherry River is great for more experienced kayakers to teach newbies in whitewater with steady difficulty along the way. The stretches of Cherry River will give you a good workout and just enough mileage to enjoy a solid afternoon on the river, with a handful of camping options along the way if you want to stay the night. To paddle the 9-mile stretch from the WaterGate Inn in Richwood to the mouth of the Gauley, the put-in is right across from the inn at 1 Bridge Avenue, Richwood, WV 26261. The take-out is at the confluence of the Cherry and Gauley rivers at Curtin Bridge along WV Route 20. To get to Richwood, you can take I-79 to exit 57. From here, you’ll follow WV Route 19/WV Route 55 into Richwood (about 46 miles).